We lost our Kitty Carlisle today. She had been sickly for some time. As you may remember, she showed up here right after I moved in. 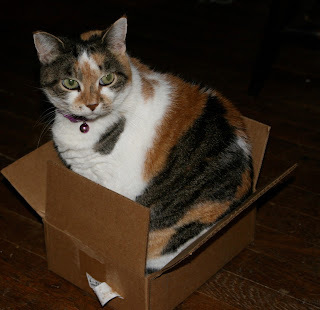 Having two cats from D.C., I didn't want another one, but she was undaunted. She stayed close by all through the winter. The first warm day, I sat out in the sun. She climbed up in the chair and kissed me. That was it. After numerous trips to the vet to make an outside stray and inside family member, she was still listed as "Cat" in her file. The vet asked me if I was ever going to name her. That day I heard that Kitty Carlisle had died. Cat and Kitty shared a lot of attributes so she became Kitty Carlisle. She was always regal, she always carried herself as though she was far superior to you, however, she never made you feel bad about your shortcomings. She was a lady till the end. What a lovely eulogy. Kitty Carlisle knew she was your cat and received your love and devotion with grace, returning it in her own way. I know you will miss here. It's very evident that Kitty made such a difference in your life and you in her's. It's a great loss for both you and your little Kitty, but they never leave our hearts nor we theirs. Coincidentally, I just had a very vivid dream about Kitty Carlisle a couple of days ago. I've always admired her and it was a lovely dream. She was just as you described her and your dear little Kitty surely would have been a joy to you - displaying all Ms. Carlisle's best attributes. I'm very sorry for your loss. You have written a lovely tribute to her. Please accept my condolences. Thinking about you and Kitty Carlisle.